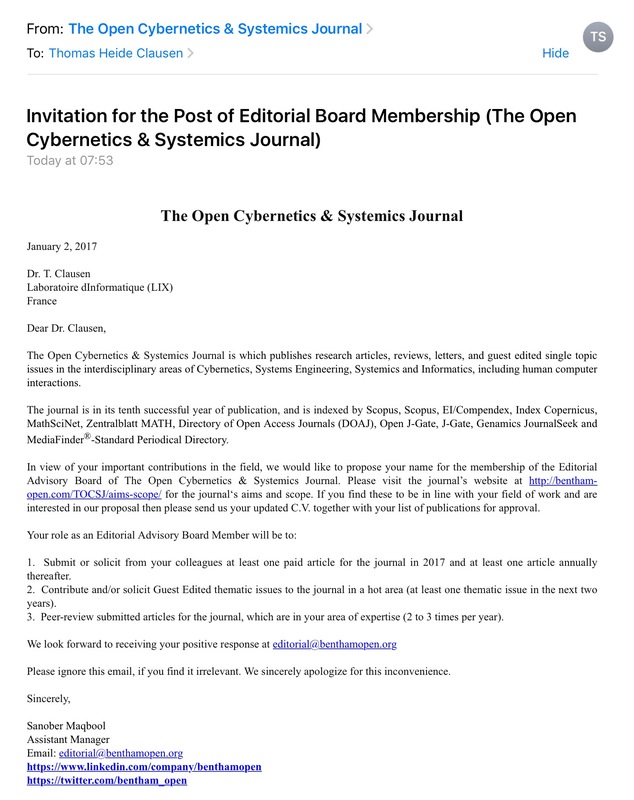 The Open Cybernetics & Systemics Journal is which publishes research articles, reviews, letters, and guest edited single topic issues in the interdisciplinary areas of Cybernetics, Systems Engineering, Systemics and Informatics, including human computer interactions. 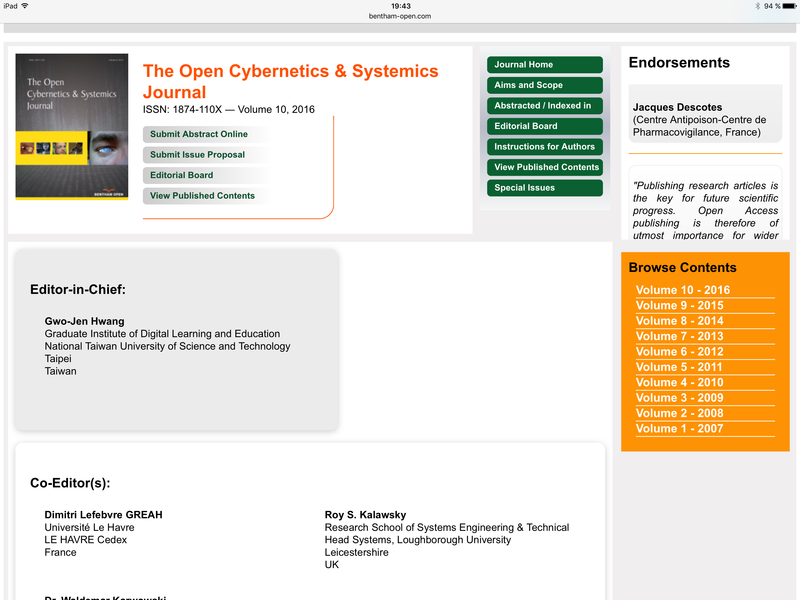 The journal is in its tenth successful year of publication, and is indexed by Scopus, Scopus, EI/Compendex, Index Copernicus, MathSciNet, Zentralblatt MATH, Directory of Open Access Journals (DOAJ), Open J-Gate, J-Gate, Genamics JournalSeek and MediaFinder®-Standard Periodical Directory. 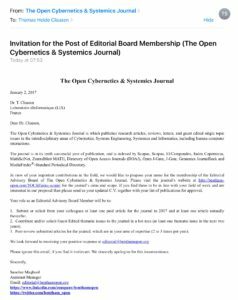 In view of your important contributions in the ﬁeld, we would like to propose your name for the membership of the Editorial Advisory Board of The Open Cybernetics & Systemics Journal. While I might not be the least competent person to have on an editorial board of a scientiﬁc journal (I do have a scientiﬁc track record, after all), I certainly should not be a pick for a journal entirely outside my ﬁeld, should I? Submit or solicit from your colleagues at least one paid article for the journal in 2017 and at least one article annually thereafter. Contribute and/or solicit Guest Edited thematic issues to the journal in a hot area (at least one thematic issue in the next two years). Peer-review submitted articles for the journal, which are in your area of expertise (2 to 3 times per year). Pay Bantham-Open, and you get a fancy-sounding line to add to your CV, no experience or credentials required. Or, perhaps, due to the “con a colleague to pay up in my place”, is that a form pyramid scheme? But wait, there’s more: GREAH is not Dimitri’s last name — but is is the name of a research group at that university, called “Groupe de Recherche en Electrotechnique et Automatique du Havre”, which counts about 20 or so researchers and faculty members. It would seem that Bentham-Open has not bothered to properly identify the names and affiliations of their Editors and co-Editors. Combined, this makes me suspect that this is an instance of Bentham Open simply listing people as its “Editors”, “Co-Editors” or “Editorial Board Members” without their necessarily having contacted the people in advance, or without the “Editors” and “Co-Editors” being involved in the editorial process.